So last week I was on vacation and I took the family to Virginia Beach. Since I would be taking a route I wasn’t familiar with, I decided to load up Google Navigation Beta on my Samsung Captivate. Before that though I had to find some kind of holder to hold the Captivate in the Dashboard. Not a easy task as the only real places I could get one was online. With shipping it wouldn’t get here in time, so I found a universal hold & made due with that. I must say I was quite impressed with Google Navi Beta and my Samsung Captivate. 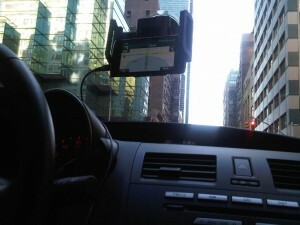 On the Samsung end, there has been quite a lot of talk about GPS issues on the Captivate and Vibrant. Mines got a GPS lock and for like 95% of the time I had no issue getting a GPS lock. Google Navigation was flawless whenever I had a GPS lock. Turn by turn directions was right on point, rerouting accurate, and I love when I could check the traffic view. This especially came in handy on the way back to NYC. We hit a bump in traffic in Philly and I was able to see how long it would last. Also like how it would turn the map from light to dark based about the time, and the information of how long we was from our destination. I would definitely be using this from now on as my main car GPS device!